Technical Partners is in the process of introducing a new water monitoring service to the Baltic region. Provide the services of a Mobile Lab (ML) for monitoring pollution levels on a continuing basis in streams, rivers and lakes. In total, the mobile lab will be able to monitor more than 20 parameters automatically on site. The ML is a trailer that is delivered to the water monitoring site. If electricity is available, it is connected to the trailer, if not – the unit has its own power generator. Sampling devices are inserted into the water. The unit can be left unattended during the monitoring period. However, provisions must be made to ensure the system’s security. The ML is directly connected to the Internet (via a separate secure server). The laboratory can be controlled and monitored remotely. Data transfer takes place directly after the measurements. The measurement results of all sensors, electrodes and analyzers are immediately available to all project partners. Regular sampling and laboratory analysis methods do not give an accurate picture of peak pollution periods. The continuous sampling of the ML provides a more accurate pollution profile during the monitoring period. Monitoring results are objective and cannot be fabricated or altered. Data is provided to a central computer and/or the clients computer on a continuous basis. Monitoring is easy for the company or organization wishing to conduct water monitoring. There is no need to purchase equipment, maintain it or to hire personnel who need to be trained to use the equipment. They just purchase the service for the required period. There is no equipment or personnel idle time, no vacations, no sick leave, etc. Usual rental periods are from 4 to 8 weeks. The aim of the mobile lab is to support and improve current monitoring systems. It is a stand-alone solution that applies the approach of innovative online analysis of water quality and the fast and comprehensive data transfer to all partners and authorities involved in the project in a practical manner. Using the ML for the monitoring of diverse discharges from diffuse sources, from households, as well as industrial pollution sources, it helps the Client prepare measures for water quality improvement quickly with comprehensive and reliable information, enabling the coordinated development and management of water, land and related resources. The ML is a trailer constructed and equipped like a chemical laboratory. Protective measures are essential. Additional equipment such as theft, burglary protection and safeguards for the environment protection are indispensable and included. The ML has an autonomous power supply and is ready for operation quickly. The ML is able to analyse the most important pollution sources directly on site – either in online-mode or by single measurements and operates (24/7). Samples are also retained for further testing if required. All analysers and sensors are part of one water cycle to enable the relevant reference of each parameter and measurement. The cycle starts with the sample being taken through a submersible pump that is attached to a buoy. The submersible pump including the buoy is directly connected to the ML. on operating costs, eliminating the risk of inaccuracy and minimising maintenance efforts. Moreover, LAR's QuickTOC is even able to accurately analyse the most difficult samples containing high loads of particles without clogging or blockages. The special injection unit is specifically developed for such applications. This online analyser is additionally equipped with further detectors and determines the chemical oxygen demand (COD) and total bound nitrogen (TNb). The online toximeter determines toxic effects of pollutants on organisms using very sensitive bacteria that are cultivated directly within the unit. The biomass is constantly self-regenerating so that the analyser is ready to measure samples at any time. For each measurement only a small amount of the test organisms are used. The biomass culture within the fermenter is not contaminated. Since there is always enough bacteria it is possible to operate this nitrificant toximeter either in online mode as well as for the analysis of single samples. Usual toxicity tests have a duration of some tens of minutes or even hours. This analyser's response time is about 15 minutes. Further methods and analysers allow the determination of single pollutants such as ammonia, sodium, potassium, cadmium, fluoride, chloride, nitrite, sulphate, and more. In addition to the water parameters the lab records the most important parameters of the environmental conditions including various weather parameters such as temperature, rainfall, wind or humidity. Hence, the Client receives full information about the meteorological conditions in addition to the water quality. the patented LAR Flow-Sampler (enables the clogging-free sample taking). The unique stand-alone character and developed data transfer system of LAR, provides measurement results directly via internet to the authorities and partners. Authorities and project partners can use the results directly for further updates and evaluation. The trailer has an approximate size of 3 x 2 x 2 meters (length x width x height) and weighs less than 1 ton. This ML needs a short set-up time to be ready for operation on site. Because of considerable differences both of the water level and of the conditions of the riparian zones (interface between land and a river or stream), sampling has to be carried out by a special buoy which can be stored on the truck and easily positioned in the river. Being mobile, the laboratory is applicable even to places that are difficult to access. Alongside rivers even problematic measurement points can be reached. The measurement period per location is normally between 1 and 2 weeks. There is no longer a need to transport samples over long distances. The ML analyzes the major sources of pollution locally. LAR Process Analysers AG of Berlin, Germany, developed into the leading supplier of online analysers for the determination of sum parameters in water. See http://www.lar.com/. 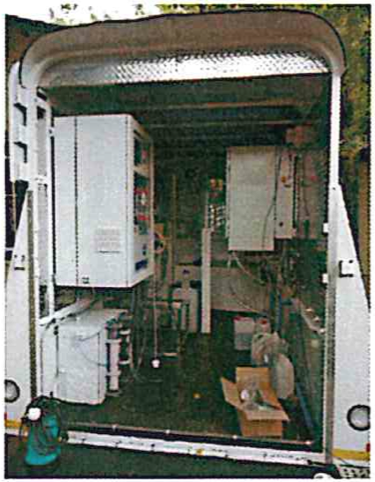 LAR has participated in a pilot project in South Africa by developing and supplying a mobile laboratory (ML) for water monitoring. Technical Partners (“TP Riga” SIA / Technical Partners International Inc.) has represented LAR Process Analysers in the Baltic States since December, 2008. The TP Riga office is located in Riga at Vienības gatve 109. Ed Kalvins – BASc - Chemical Engineering (University of Toronto, Canada), Owner / Project Director. 40 years of Project Management, Manufacturing Management and Engineering Management experience in Canada and Latvia. Alvis Līdums - BA – Economics – Manufacturing, BA – Business Administration, MA – Public Administration (University of Latvia). Project Manager. Industrial Engineering and Project Management experience. Technical specialist.